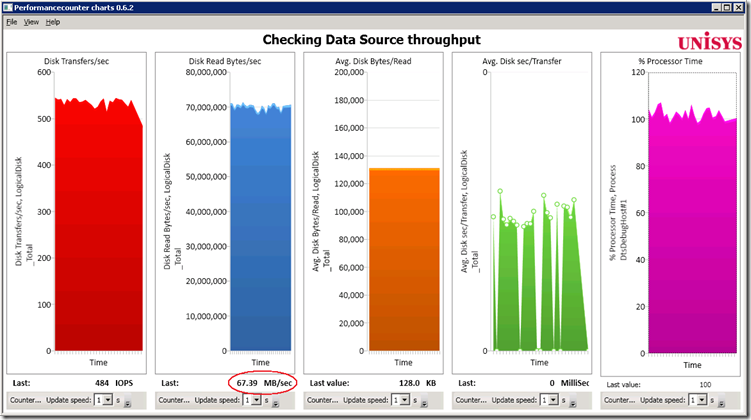 Since we set the ETL World Record with the introduction of SQL2008, a lot of insights, tips & tricks have been published on what it takes to load data fast into SQL (see also the Data loading Performance Guide). 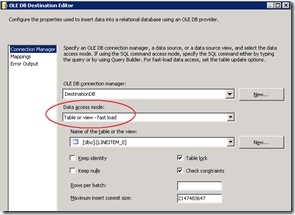 The trick described below is one to remember if you are being challenged to load a single flat file as fast as possible into SQL Server. 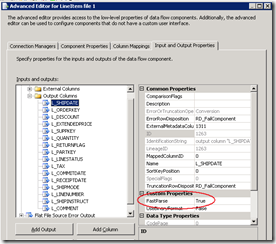 The fastest way to do this is to build an SSIS package to handle the pre-processing of the data type conversions so this doesn’t have to be done on the SQL Server side, saving precious CPU ticks and more important – latency. 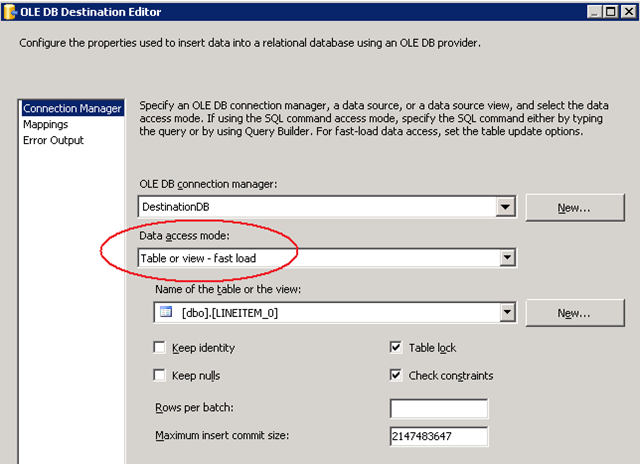 Next thing is to run this SSIS package on the SQL Server itself and use a fast, low latency, in-memory connection to eliminate the network stack overhead. 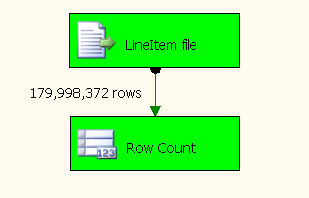 As always, start with checking the throughput of the data source by using a Row Count component (see picture). Select the input columns to insert (see also Speeding up reading from a data source). Out of the box it takes 8 minutes and 6 seconds to read the Full 22.7 GB of data from the flat file with 16 columns of data. By enabling the Fast Parse option on the appropriate Output columns it takes only 5 minutes 53 seconds to read the entire file, which is 13.7 % faster (or 2 minutes 13 seconds less). Bulk Insert Result: It takes 19 minutes 55 seconds to insert 22.7 GByte of data , or almost 180 million rows. This is an average 19 MByte/sec or 150000 rows/sec. 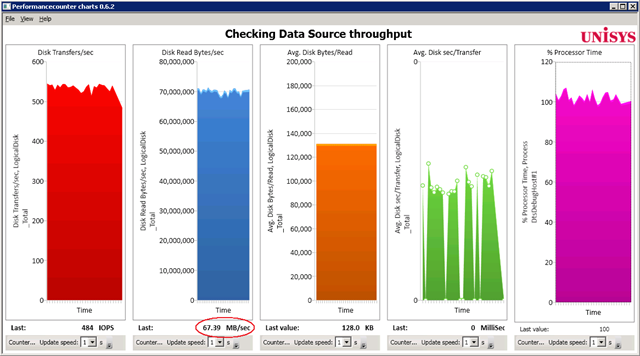 During the validation of the source throughput we measured an effective Read speed which was 3.5 times faster than the current throughput we are getting with Bulk Inserting. It’s good to know that the reader isn’t our primary bottleneck. 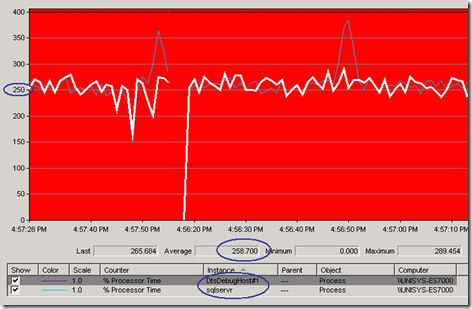 Looking at some other basic perfmon counters, like the disk write queue length and the CPU load of both the SQLServer and the DTSDebughost (BIDS) process don’t show any significant bottleneck; both the processes use less than a CPU each. 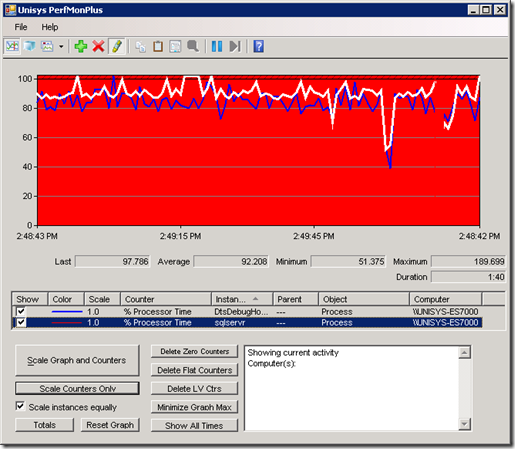 To increase the overall throughput we have to build some parallelism into the data flow. SSIS will allow us to do just that! 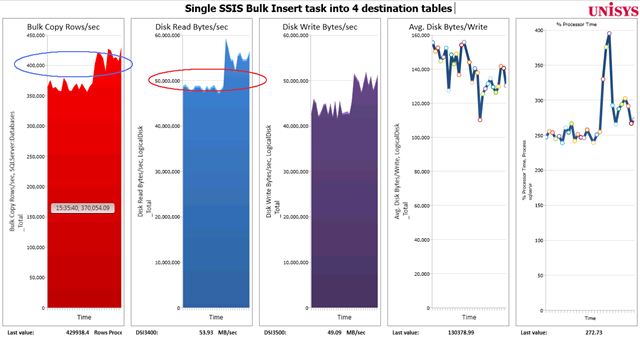 Let’s find a way to spread the load and bulk insert the data from the same flat file into 4 different destination tables, instead of just one, and find out if we can get the throughput up ! Since we can read 3.5 times faster from our data source than we are writing it out to SQL Server, we should spread the load across at least 4 streams. 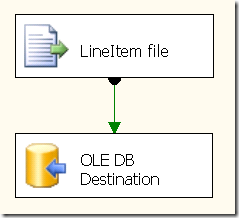 In SSIS you can build this into a package with the Modulo function (%). The Modulo function provides the integer remainder after dividing the first numeric expression by the second one, the ultimate striping mechanism! That’s at least 2.5 times faster ! Unfortunately, I think there isn’t much we can do about either the “ASYNC_SYNC_NETWORK_IO”; we are using the max. 32 KB packet size and an in memory connection. Also the “PAGEIOLATCH_EX” (caused by an exclusive lock on the buffer while the page is transferred from “disk” to cache) is a tricky one; I tried to reduce the PAGEIOLATCH_EX by adding a second flat file data source that reads from the same input file, each processing 2 tables, but no, I can’t get it any faster. Think we have to live with the 2.5+ times faster for now! 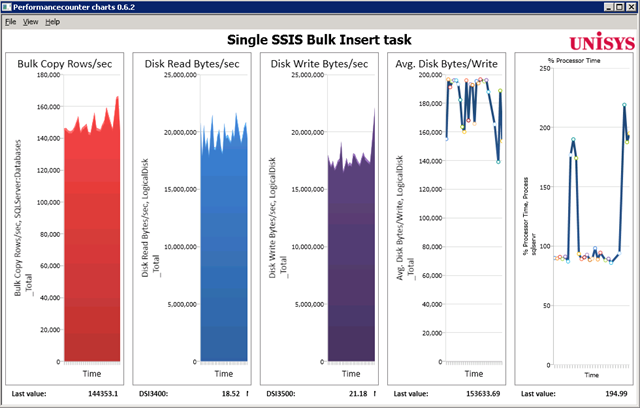 Both the SQL Server process and BIDS use on average more than 250% Processor time, or 2.5 CPU’s each to service this optimized SSIS Package. 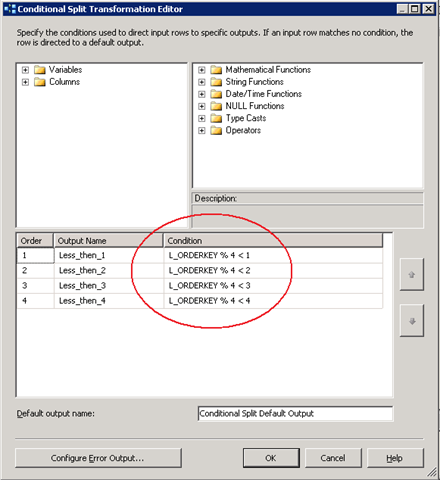 Create either a View across the 4 tables or build a partitioned table that allows you to switch the 4 tables back in into a single large table if that’s needed. When you have to load the data from a single flat file as quickly as possible into SQL Server, the technique described above will bring you a significant increase in Bulk Insert throughput and a decrease in execution time needed. 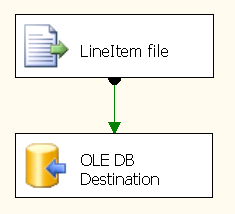 Also start the SSIS package on the SQL Server, use a solid State disk as staging area for the flat file and stripe the data into multiple tables. The example above showed we can load the same data file at least 2.5x times faster! One of the best and clearly laid out post in a while. Thanks for sharing. Very useful post, Henk. I am going to bookmark it for future use. indeed, when using the < in your SSIS package you have to make sure you set the ordering right ; start with L_ORDERKEY%4< 1 as the first one in the list followed by L_ORDERKEY%4< 2 etc. What about using a RAM drive instead of an SSD? yes, I worked with Ram drives in the past but the quality/read throughput wasn’t that impressive at the end, especially when reading multiple files in parallel. (I did found that NTFS formatting a ram drive with 64 KB blocks instead of 4KB brings a huge performance boost!) Please share your test results! 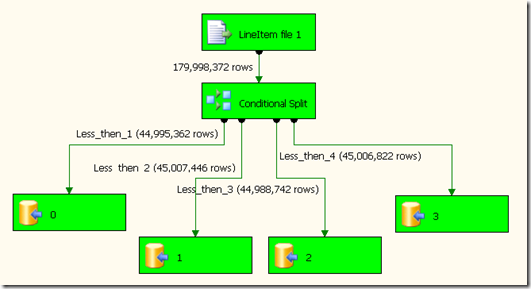 Was wondering if it was possible to use the SSIS package to load into multiple tables from a single csv file and if you have come across any examples which could be helpful to me in implementing it. Hi , yes thats possible ! Henk, Thanks a lot for this highly informative post. I am going to use this technique in my project. I have a question regarding consolidation of split tables. Question is that when we would consolidate tables, would data be in same sequence, in table, as in source flat file? Great Post indeed. I have have somewhat different scenario where I have two flat files and one destination table. catch here is I can not split this table. What do you think will be the best method to load? fastest way to load 2 flatfile into a single destination table would be to load each flatfile into a separate table and partition switch them in afterwards. 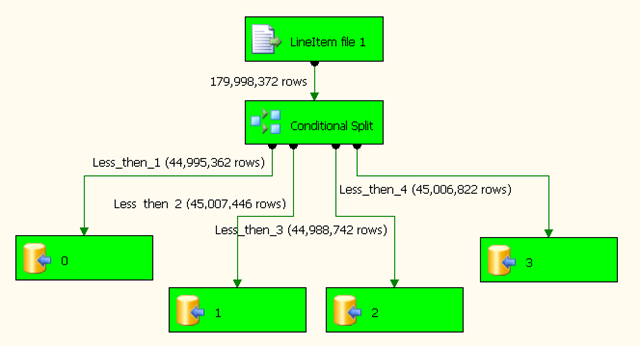 I have loaded 15.8 million using this approach (4 destination tables). It took 11 minutes. But without 4 destination (1 destination) it took 19 minutes. But I need actually one table. I attempt to load the data in 4 partitions. Then tried to merge them. Unfortunately it took more than 30 minutes to complete. With 2 core (16 logical processor) with 48 GB of memory. Am I missing something? 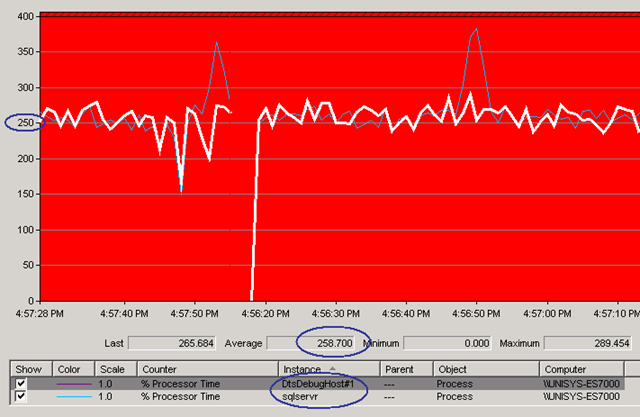 on a server having 4gb of memory using SSIS. Hi Sid, just start and load it! SQLServer will handle it for you. what is the benefit of using views for the same table in destination?? as you mentioned in section 4 (Consolidation) of this article. 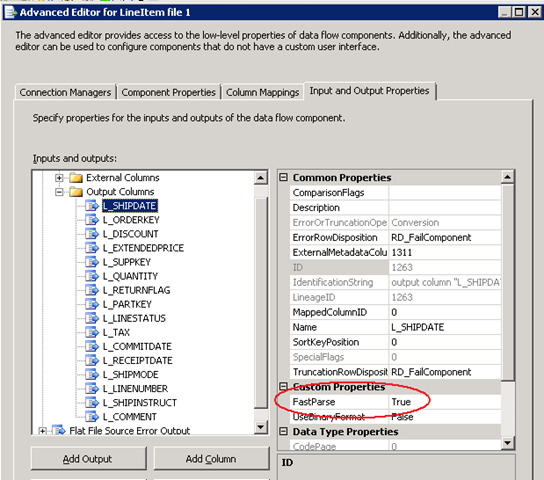 Hi Zaim, the result of step 3) is inserted data that is stored in 4 different tables. To turn this into 1 logical representation of the data you can use a view to consolidate, or better switch partitions in into a single table. Very nice/easy to follow this Henk. Will this logic work if we have thousands of flat files? to load into a single table? Please advise. hi Sashi, for many files I would recommend to keep things simple and load as many files in parallel as the number of cores you have in your system. 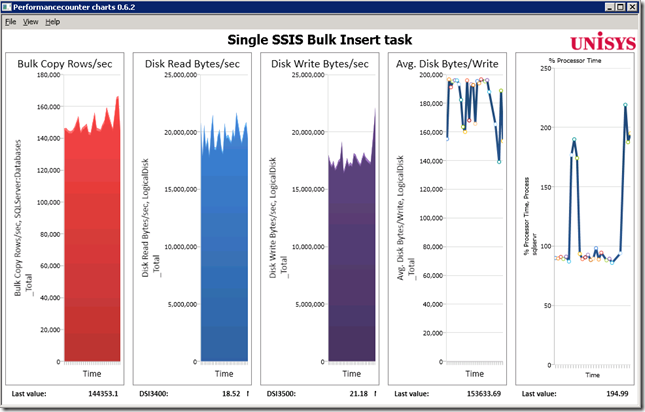 Loading data via SSIS is typical the fastest since you can leverage SSIS to do some preprocessing so that SQLServer just has to write out the data. I have a flat file having 800k data..Normally it is taking too much time to insert the data. Need to create a package using parallel processing so that we could insert the data from flat file easily and in very less amount of time. hope it helped to reduce the overall time taken Ranjay!